There is no server, all connections are P2P. Really? Does that mean it will remain this way at release? Hopefully it doesn't become an issue. I'm curious to see what other modes the full game will have and the story campaign. The beta had the three main modes plus there are supposed to be two other 4v4 modes in addition to a story mode that can be played coop. I liked the revenge option when double teamed as I don't remember that in the alpha. I still think Ubisoft needs to put out a comprehensive guide for each warrior. Some site have decent info but each character has a deeper set of strategies. I didn't realize the Conqueror had an AOE attacking if I hit both light and heavy at the same time. This is a good article about the lack of honour in this game lol. It is true - there are too many 2 on 1s in the 4v4 Dominion model. We'll see if the scoring system forces people to spread out. I do know that in that mode it's best to try to stick near a teammate. Running around by yourself, which will happen often after a death, gets you into a lot of trouble. More impressions and thoughts on some fighters being OP. The one class Nobushi is a bit OP (female, super quick). Last edited by Rudy; 01-30-2017 at 08:18 AM. Looks like there will be an open beta the weekend before release! For Canadians you can trade two games straight up for this one. I took advantage as this is a great deal. They have a list of eligible games which need to have at least a $12 trade in value. This weekend's open beta is now live. I really like the 4v4 death match but the servers are still garbage. Match making isn't great and drops or connection issues during fights is a problem. I fear the retail game is going to have the same issues. I'm going to focus on learning the Viking Warlord better. The game is fairly deep with moves. And as you level up you unlock cool feats on the dpad. My son just through a javelin at someone who tried to run away. If you are a Target Cartwheel member, you can get the standard or Gold Edition of For Honor for 15% off this week. I didn't get a chance to play last night since it was Valentine's Day and the wife would not have been so happy lol. But I did play this morning and I found there were still some connection issues. Not sure if it will be as bad as the betas but it's not surprising. It was nice to see 3 extra Heroes to use. I want to use the new Knight more. They added some "Skirmish" maps to the retail game for the 4v4 DeathMatch and I wasn't really crazy about that. To me those Skirmish battles are a hybrid of DeathMatch and Dominion (a few minions, no zone bonuses but respawns and more double teaming). It isn't bad but I prefer the Elimination ones better. I hope they split out those two modes as I don't like how I don't have a choice in what mode I'm playing other than voting on the map. Haven't checked out the story mode yet. I got absolutely destroyed this morning in a couple death matches. There were two great fighters. One used the fat samurai and was so deadly if you were too close. He kept picking me up and breaking me. So powerful. I need to time my break block better or dodge more. Another guy was a level 16 basic samurai and he never died in two matches. I think he was 14-0 against my team and killed me quite often too. The experienced fighters are so good in this game. I will never compete with them. I did go 6-1 in one match last night which was my best. But normally I'm pretty average and this morning terrible. I did play some Dominion which is fun but I prefer Death Match. Patch on the way. Valkyrie gets a needed buff but it sounds like the Peacekeeper will be harder too. I don't agree with that. That character is really tough to beat when controlled by someone who knows how to fight. I like the guard break returning to the beta style. Not sure what else is in there. Last edited by Rudy; 02-28-2017 at 06:57 AM. Got double teamed in a brawl but was victorious! THis is a cool site to track your matches, kills, deaths, win percentage and hours played. My win percent is under 50 on Deathmatch but better than that on the other stuff. Pretty neat. Patch is out. 3.4 GB on PS4. I play this game everyday. I still love it and think it's very strategic and balanced for the most part. I'm curious about any new modes they add but Elimination and Dominion are still my favourites. The connection issues are still a big problem. Constant sync issues are annoying and a real shame for such a great game. And then you face some douchebags that run at the start of the fight in Elimination or only want to fight near ledges and try to throw you off. I HATE environmental deaths. Some maps are brutal that way and most people don't like them. I hope they add more open maps without peril. Dominion is better this way though. If I could change a few things, besides dedicated servers, I would increase the stamina cost for doing guard break. Some people like the Conqueror can spam that too easily. It should cost more imo. Second, there should be no boosts for the first 30 seconds of Elimination Death Matches. I HATE when you square off and your opponent goes running to collect boosts rather than fighting. I'd prefer at least a short time period where that isn't advantageous. I'm still not a fan of Environmental deaths. Some characters can push and direct other players too easily for quick and cheap deaths. It's part of the game but not one I like very much. Some maps are difficult to avoid this stuff while others are fine. I'd like to see a few new maps where environmental deaths are less easy to pull off. I know Valykrie got a buff but I'm still not scared of her when I face her as my Warlord. I think Peacekeeper, Berserker and Conqueror give me the most fits. 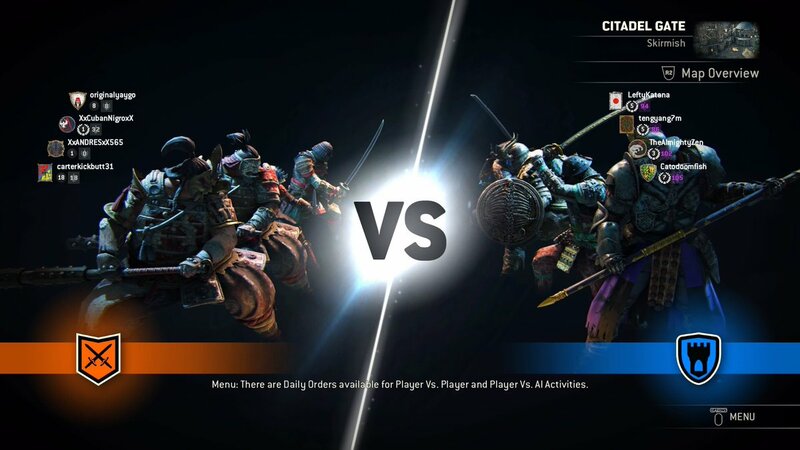 One other thing - the matchmaking isn't very balanced at times. My son was on a brutal team the other day. Unless that's a group of 4 linked together on the right I don't see why the game would do this. Last edited by Rudy; 03-21-2017 at 07:12 AM.